SCREEN Graphic Solutions Co., Ltd. (SCREEN GA) is one of the world’s largest manufacturers and suppliers of production systems for the prepress and printing industries. Our large range of equipment includes the Truepress Jet series of large format inkjet printers, UV inkjet label presses, sheet-fed and web-fed inkjet presses, the Equios workflow system, RIPs, and computer to plate systems. SCREEN GA is a division of SCREEN Holdings (Kyoto, Japan), which is also a well-known manufacturer of production equipment for the semiconductor and flat panel display manufacturing industries. Since 2005 Inca Digital Printers have also been part of the SCREEN GA group. Based in Cambridge in the UK, Inca Digital Printers are a leading manufacturer of wide-format ink-jet equipment. In addition to selling equipment under the ‘Screen’ brand, we also manufacture products for a variety of OEM partners. With 75 years’ experience in the graphic arts industry SCREEN are acknowledged as one of the leading manufacturers of printing machinery with a reputation for high quality and outstanding reliability. We manufacture printing equipment for a wide range of markets, such as books, labels, folding carton, newspaper, direct mail, transpromo, packaging, wide format and commercial printing. 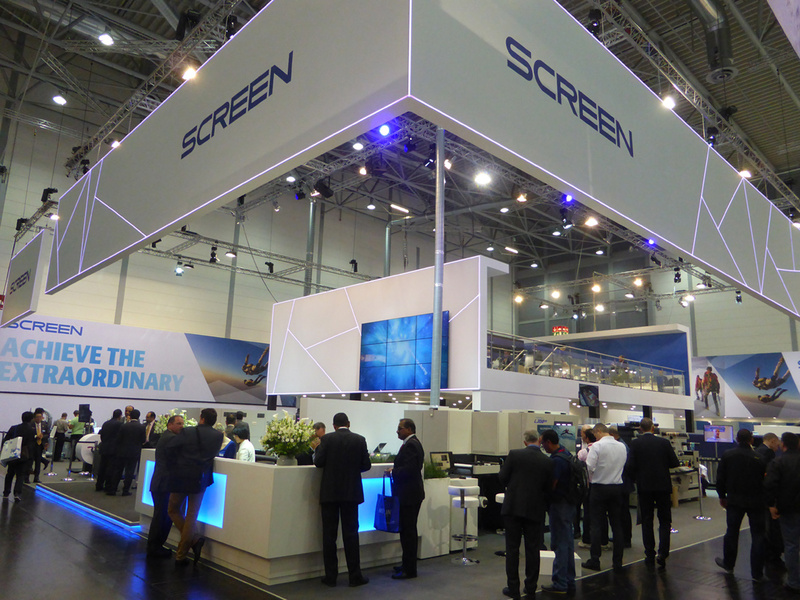 SCREEN Europe is a wholly owned subsidiary of Kyoto, Japan based SCREEN Graphic Solutions Co., Ltd and is responsible for EMEA (Europe, Middle East & Africa) business. At our European headquarters in Amstelveen, Netherlands we have our Solutions & Technology Centre, where our Truepress Jet POD inkjet printers are available for demonstration to potential users, and for test print sessions to evaluate quality, performance, and integration possibilities. With SCREEN digital solutions we continually strive to streamline the printing process whilst also improving quality and performance enabling us to maintain our position as a market leader. Our core technologies and specialist knowledge, combined with on-going investment in product development leads to new advances in both software and hardware which enable us to supply the print solutions that our customers need. Although Screen Holdings (Screen) was established in 1943 the roots of the company go back to 1868 when Saigiro Ishida the great grandfather of the current president, Akira Ishida, established a copper plate and lithographic printing shop in Kyoto. The subsequent acquisition of several patents by Saigiro Ishida, and his son Keizo Ishida, laid the foundation for the formation of Dainippon Screen Manufacturing Company Limited on October the 11th 1943 in Kyoto Japan. Initially, Screen concentrated on the production of glass screens, but in 1946 it broadened its product line with the development and manufacture of wooden process cameras, arc lamps and vacuum printing frames with the aim of becoming a comprehensive manufacturer of photographic reproduction equipment. 1953 Screen builds its first manufacturing facility in Horikawa, Japan, the first of 10 plants it has today. 1962 Screen is listed on the Osaka securities and Kyoto stock exchange and starts marketing its first electronic colour scanner. First appearance at Drupa. 1963 Screen starts production of a metal mesh for color CRT’s. The Auto Graver, an electronic machine for engraving halftone blocks directly onto the plate from a reflection or transparency original, is launched. 1966 The company launches its first colour scanner – the Scanagraph mark 1 and opens first overseas office in the US. 1980 Together with Toppan Printing Co., Ltd., Screen develops a system that directly inputs video image signals to a scanner and then outputs four-colour film. 1990 Screen recognizes the need to meet the requirements of the rapidly growing desktop market and introduces the first desktop colour scanner Postscript imagesetter. 1995 The last step towards fully digital prepress production or computer to plate is achieved with the introduction of the first PlateRite at the Drupa exhibition in Germany. 2000 Screen launches its first digital presses at Drupa: the TruePress 544 four-colour digital offset press and the TruePress V200 monochrome printing system as well as the Trueflow web-browser based PDF workflow solution. 2001 The eight-page PlateRite 8600 is launched in May with the ability to handle Heidelberg GTO plates. 2003 The high-resolution GenaScan A1 flatbed CCD scanner is launched for flat and 3-D items. Trueflownet, Screen‘s innovative JDF-enabled business environment is announced – a JDF-based, end-to-end operating environment designed to drive highly-automated and streamlined print ordering and production, with fully integrated print production management. 2004 Bumper year for new products launched at Drupa including: next-generation TruePress 344 digital offset press as well as CTP devices ranging from 4 page to 32 page. 2005 Screen increases its inkjet knowledge bank and increases its product portfolio through the acquisition of Inca Digital, the world’s leading manufacturer of UV flatbed printers. World’s first showing of Truepress Jet520, a revolutionary high-speed inkjet press using Piezo Drop on Demand inkjet heads from Epson. 2007 Screen shows its first ‘Screen brand’ wide format UV printer, the Truepress Jet2500UV. 2012 Another Drupa year with a range of new products including a world preview of the Truepress JetL350UV a machine designed for the fast growing short-run and personalised label market. Screen‘s wide-format offering expands with the launch of the Truepress JetW1632UV. The first device to be manufactured for Screen by Inca Digital who have been part of the Screen Group since 2005. 2013 Following the success of the Truepress JetW1632UV the next generation device to be manufactured for Screen by Inca Digital, The Truepress JetW3200UV is launched, with both models being shown side by side at Fespa in London in June. 2014 Enhancements to the wide-format range continue with the release of the high speed model of the Truepress JetW3200UV. 2015 The latest model in the Truepress Jet520 range of high speed web printers, the Truepress Jet520HD, goes into production at a printer in Holland. 2016 Another Drupa year sees a raft of new product releases. New CtP machines launched include the PT-R4600 range of B2 platesetters, and the PT-R HD8900N series of B1 platesetters. Also shown at Drupa is the next generation Truepress Jet520 machine – the Truepress Jet520NX. 2017 Screen releases SC Ink for the Truepress Jet 520HD, enabling direct output to standard offset stocks without the need for a primer or pre-coat. At Label Expo in Brussels, Screen introduced two new models of the successful Truepress Jet L350 Digital Label Press. The Truepress Jet L350UV+ with support for thin substrates, and the Truepress Jet L350UV+LM with low migration inks thus broadening the range of supported label printing applications. Consumer needs are changing. Print is required in faster turnaround times, needs to be more cost effective at a wider range of run lengths, quality is a prerequisite and the printed document needs to be more effective as a communication media. In addition we must consider the ecological factors that are driving our industry, and that the use of corrosive chemicals and solvents need to be reduced or even eliminated. This all points to a greater use of digital printing and this is the main focus of Screen’s future development. Screen has already demonstrated and launched inkjet presses for wide format, labels and packaging as well as books, newspapers, direct mail and transactional printing. Research and development investment levels increase each year and new products are constantly under development and evaluation. We hold a leading market position, but we are not complacent and recognise that sustained competitive advantage is a goal we must continue to work towards. Dainippon Screen Manufacturing was rebranded as Screen Holdings October 1, 2014.